I only have the free PlayStation Plus games for January 2019 to share with you today as Microsoft has yet to reveal their Games with Gold lineup yet. 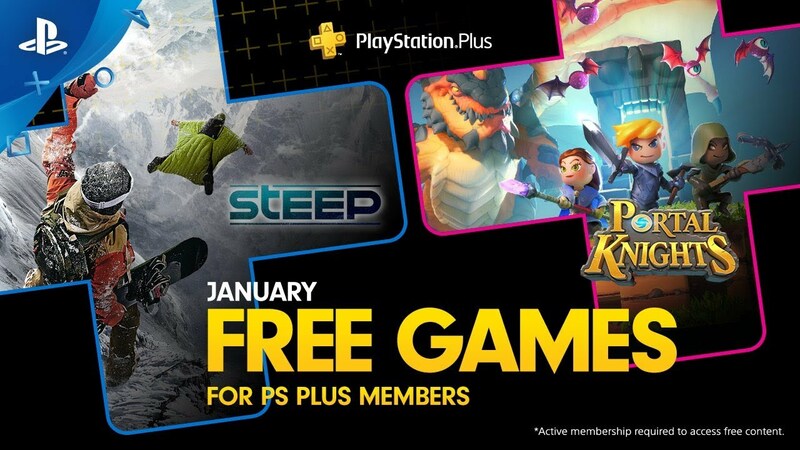 Sony is offering up games like Steep and Portal Knights for PlayStation 4 owners in the new year. January has typically been a bit of a slower month for the service, which is really unfortunate for those who just got new consoles during Christmas. First up, we have Steep. The mountain is yours to explore in this massive open world sports game. Drop in to the most epic mountains, and ski, wingsuit, snowboard, and paraglide your way to victory. This game is for those looking for a little excitement this winter season. Next up, we have Portal Knights. Step into the fantastic and unknown in the delightful action-RPG. You can explore alone or team up with up to three other friends in cooperative multiplayer*. This is a delightful romp of a game that is sure to please many of you. And as a reminder for those Warframe players, Digital Extremes’ dev team has you covered! The Warframe: PlayStation Plus Booster Pack III has a little bit of everything to jump start your game. This includes 100 Platinum, 100,000 Credits, Quanta (a Corpus laser rifle), Quanta Obsidian Skin, 7-Day Affinity Booster, and a 7-Day Credit Booster. PS Plus members can get the pack for free from now until January 15, 2019.